Hello guys I have been stuck on a few question. Mainly the last 8 and would it be possible if someone can explain how to do the questions? Would be much appreciated. Thank you! On question 17, the letter not shown properly is meant to be 'e'. The link you provided is not working for me. Hmm, I've re-uploaded it onto a different hosting website. 13.� t = 2*32� = 64�; t + 2n = 180�, so n = 58�. 14.� a = 50� - 18� = 32�. Angle ACB = 90�, so b = c = 40�. 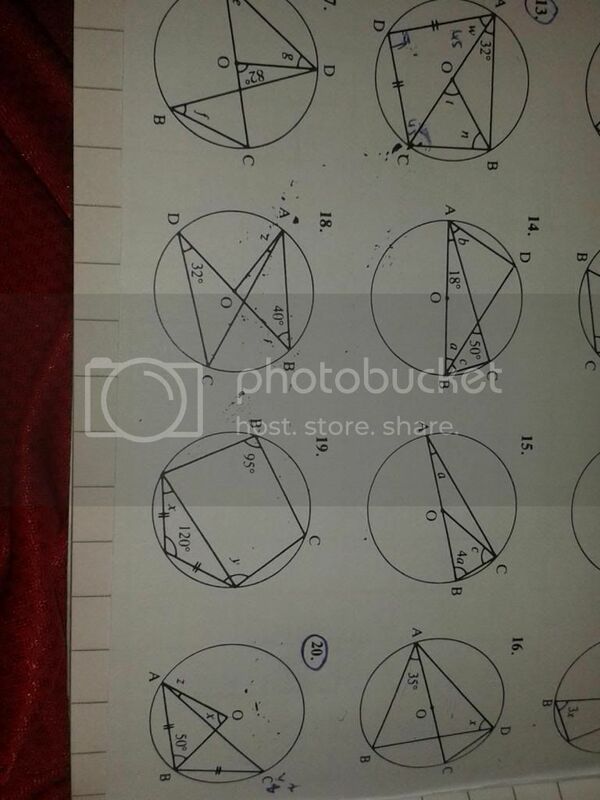 15.� 4a + a + a + c = 180� and c = 4a, so a = 18� and c = 72�. 16.� Angle BDC = 35� and angle ADC = 90�, so x = 55�. 17.� f = e = g and e + g = 82�, so e = f = g = 41�. 18.� Angle BAC = 32� and angle OAC = 40�, so z = 8�. 19.� x = (180� - 120�)/2 = 30�, so y = 180� - 95� + 30� = 115�. 20.� Angle OAB = 50�, so x = 180� - 50� - 50� = 80�. � � � �Angle BAC = angle BCA = x/2 = 40�, so z = 50� - 40� = 10�.